Stop & Shop is the only major supermarket chain in the northeastern US with a largely unionized workforce. It’s owned by the Belgian-based company Ahold Delhaize, which also runs the Giant and Food Lion supermarket brands. The company said in a statement that it’s disappointed that workers chose to carry out a stoppage to “disrupt service at our stores.” They argue that their offer, which includes bonuses and some pay raises, is reasonable, and that the union’s proposal would increase labor costs for the chain. “This would make our company less competitive in the mostly non-union New England food retail marketplace,” the company wrote Thursday in an updated summary of contract negotiations. The company said it’s prepared to keep stores open, but some have closed because they don’t have enough workers. In a show of support for striking employees, many customers have refused to cross the picket lines. Within 24 hours, the Stop & Shop stoppage has become the largest private sector strike in at least three years, showing that last year’s labor unrest was not an isolated phenomenon. A record number of US workers went on strike or stopped working in 2018 because of labor disputes with employers, according to data released in February by the US Bureau of Labor Statistics. 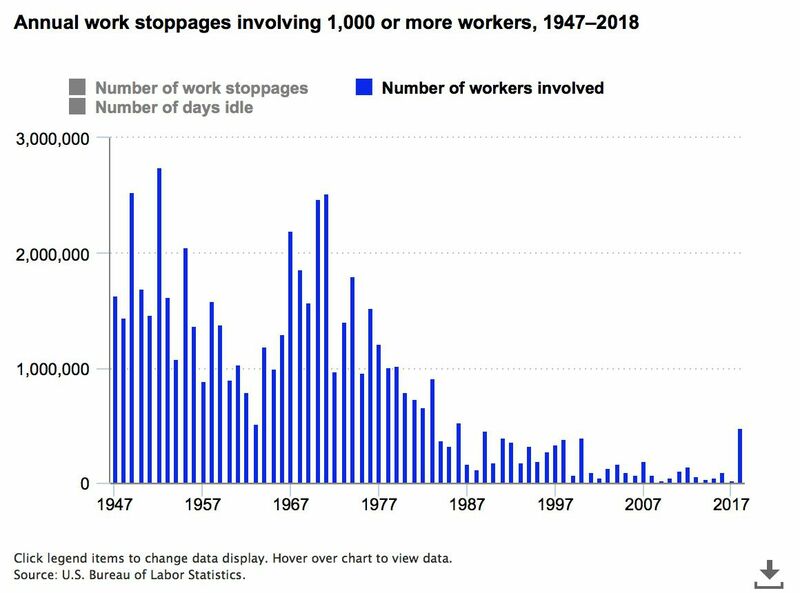 A total of 485,000 employees were involved in major work stoppages last year — the highest number since 1986, when flight attendants, garbage collectors, and steelworkers walked off the job. The increasing number of workers involved in labor strikes suggests that average Americans are not experiencing the “economic miracle” that President Donald Trump has described. They see the economy expanding and profits growing, but this doesn’t extend to their paychecks. To be clear, not all 485,000 workers involved in the 2018 stoppages were on strike. That number includes people who couldn’t work because employers temporarily shut down operations during the walkouts. It also includes lockouts, in which an employer refuses to let workers do their jobs when they are involved in a contract dispute. The Stop & Shop strike is the latest sign that widespread worker angst isn’t subsiding. The supermarket stoppage is nearly as big as the strike that shut down all of West Virginia’s schools last year (25,000 teachers participated in that strike, compared to 31,000 grocery store workers now). Earlier this year, in January, Los Angeles public school teachers ended a strike that shut down the nation’s second-largest school district for more than a week. It’s unclear when Stop & Shop employees will return to work, but they don’t seem too worried. State lawmakers, members of Congress, and 2020 Democratic presidential candidates, such as Sens. Elizabeth Warren and Bernie Sanders, have all pledged their support for the striking workers.